Bewitched by Batagur Poking and prodding into knowledge about the most beautiful turtles that grace our planets rivers and estuaries. In his fifty years at the British Museum of Natural History, John Edward Gray described 306 reptile species (1)(Uetz, 2010). It would appear that he was a classic “splitter”; naming one species under several names. One group that benefitted from Gray’s nomenclatural creativity is the genus of six species of large river turtles, Batagur. When he named the genus, he gave no etymology and none has since been deduced, leaving the word without meaning other than being a genus of turtles. This genus has been at the heart of scientific exploration of the 19th century and has seen the struggles of European colonisation of Asia. Members of the genus have been revered as the property of Royalty and most populations have been decimated through their harvest of adults and eggs. Batagur contains five of the twenty-five most endangered species in the world (TCC, 2011). Consequently, Batagur turtles have been the subject of innovative conservation breeding efforts, taxonomic and genetic analyses, and provide an intriguing case study for biogeography in terms of dispersal and speciation. My own interest in turtles has taken me up Australia's east coast chasing long-necked turtles (genus Chelodina), studying the turtle trade in Cambodia (Holloway, 2000; Holloway, 2003a), work at the turtle rescue and rehabilitation centre in Cuc Phuong National Park, Vietnam, spend time studying B. affinis in Cambodia (Holloway, 2003b), and Malaysia, and even to have contributed to the description of a new subspecies, of B. affinis (Praschag et al, 2008). 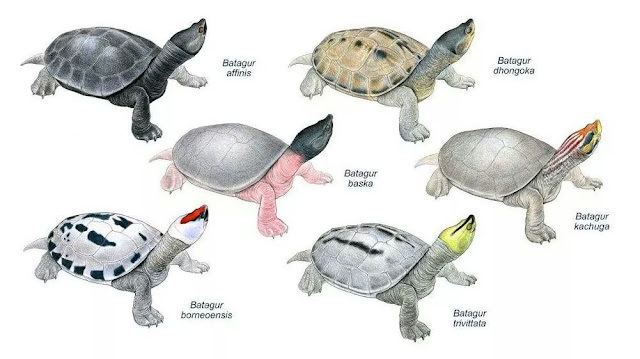 This blog is intended to explore the current knowledge of the genus Batagur and examine the many features that make these turtles beautiful and bewitching beasts. Holloway, R. 2000. Factors affecting the trade of non-marine turtles in Cambodia. Honours Thesis. University of Canberra. Canberra, Australia. 68. pp. Holloway, R. H. P. 2003a. Domestic trade of tortoises and freshwater turtles in Cambodia. Linnaeus Fund Research Report. Chelonian Conservation and Biology 4:733–734. Holloway, R. H. P. 2003b. Natural History Notes on the River Terrapin Batagur baska (Gray, 1831) in Cambodia. Research Fellowship Program Report for WCS. Praschag, P., Holloway, R., Georges, A., Päckert, M., Hundsdörfer A.K., and Fritz, U. 2009. A new subspecies of Batagur affinis (Cantor, 1847), one of the world’s most critically endangered chelonians (Testudines: Geoemydidae). Zootaxa 2233:57–68. TCC, 2011. Turtles in Trouble: The World's 25+ Most Endangered Tortoises and Freshwater Turtles - 2011. Turtle Conservation Coalition for IUCN Tortoise and Freshwater Turtle Specialist Group. The Malay peninsula plus Sarawak on Borneo are the home to two species of Batagur: B. affinis(both subspecies: B. a. affinis and B. a. edwardmolli) and B. borneoensis (Iverson, 1992). These two species coexist in some rivers while vast differences in mating and nesting isolate the species from interbreeding. They have both been reported as existing with Sonneratia spp of Mangrove Apple trees (Guntoro, 2012a, Holloway, 2003), the fruit of which was long-thought to be a staple of the species. One of the modern strongholds for turtles of the genus Batagur is Malaysia, where several factors have led turtles of the genus to exist in a relatively good situation. This country is home to two species: the Southern River terrapin (B. affinis) and the Painted River terrapin (B. borneoensis),and would have the largest wild (and probably captive) populations of both of these species. Why this is so is doubtless due to a number of factors including the ecosystem niche area available for these species to inhabit, the culture of the peoples of Malaysia, the relative political stability and subsequent economic stability of the nation, and the efforts of conservationists within and beyond government that have focused on these species for many years. I was born in Australia and raised between here and various countries in Asia. While I was keen on the Teenage Mutant Ninja Turtles as a child, it wasn't until some good friends and fortunate opportunities struck at the age of 19 that I was bitten by the turtle bug. I've worked on the turtle rescue centre in Cuc Phuong, Vietnam and with Batagur affinis in Cambodia an have been fortunate enough to work with some of the most preeminant turtle researchers in the world.